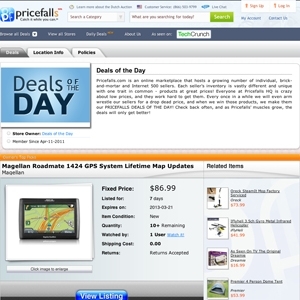 Pricefalls.com was founded in 2008 when economics major Elliot Moskow felt that the online world needed an online marketplace which can improve the user experience by eliminating certain aspects of online auctions which he believes frustrates users; bidding wars, sniping and inflated prices. As a result, Elliot Moskow decided to start up Pricefalls which uses the dutch auction model. Today Pricefalls sells everything from appliances, automotive items, books, DVDs, electronics, jewelry and more. As far as selection is concerned, their inventory is growing on a regular basis, as their list of sellers grows. Currently, the list includes individuals, brick-and-mortar sellers as well as Internet 500 sellers. Interestingly enough, while browsing their daily deal section we came across an item being sold by 5StarDeal. Pricefalls.com currently ranks #57 amongst sites offering online deals -- Novica ranks #56. In the General Merchandise category, Pricefalls ranks at #27 -- Novica.com again ranks slightly higher at #26.